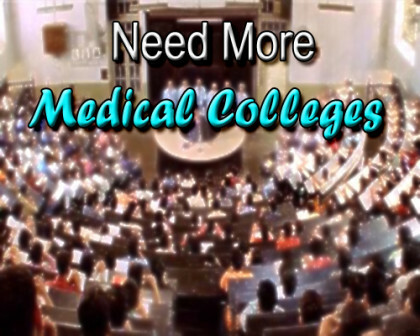 The country is in need of more medical colleges to meet the growing need of doctors and other para medics in the country, which is quite inadequate at present. The country is capable of producing huge talent of human resources in the medical field, and we need to expand quality medical institutions and medical colleges in the country. This was stated by Shri Arun Jaitly, Union Minister for Finance, Corporate Affairs and Information & Broadcasting during his address at the 43rd Convocation of AIIMS, New Delhi, here today. Shri Jaitley also stated that there is a need to look into the policy on organ donation to learn from the best practises across the world, in the Indian context, and without commercialising it. Also present at the convocation function were Prof. M C Misra, AIIMS Director, Prof. Balram Airan, Dean AIIMS, senior officers of the Ministry of Health and Family Welfare along with faculty and students of AIIMS. The 43rd convocation also marked the Diamond Jubilee year of AIIMS, New Delhi.